The U.S. Navy Test Pilot School, located at Patuxent River, Maryland, has a rich heritage, and through its halls have walked some of history’s most notable figures in the fields of Air and Space. Early in 1945, an informal 3-month Test Pilot’s training program was initiated, which evolved into a formal 6-month program Training Division by 1948. By the late ‘50s, it was officially designated the U.S. Navy Test Pilot School, and its program lengthened to 8 months. Over the years, USNTPS would go on to train experienced pilots, flight officers and engineers to become Test pilots, Test Officers and Test Engineers. All U.S. military services, including the U.S. Coast Guard, NASA, FAA, industry, and numerous foreign countries send personnel to the school. To date, the members of well over 100 classes have graduated. They have played and continue to play major roles in all aspects of test flying in the aviation industry. 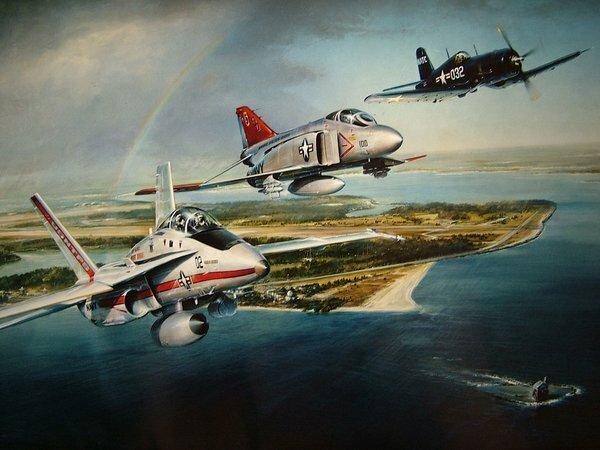 In 1995, USNTPS commissioned John Shaw to paint Thunder Over the Patuxent to commemorate their Golden Anniversary. In this scene, three types of aircraft which they felt best represented their 50-year history, ranging from a post-war F4U Corsair, to the F4 Phantom, to the FA/18 Hornet, all in original USNTPS colors.